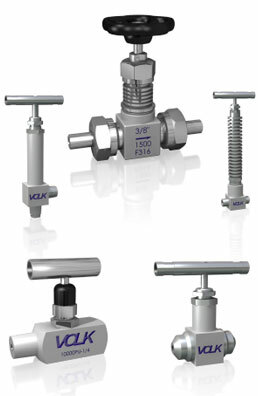 Handle: For ease of use and consistent operation and performance, the valve is provided with a rigid, stainless steel handle secured by a locknut. Needle: Non-rotation stainless steel needle provides Zero Leakage and Long Service Life. Packing: The valves are available with different packing materials for different operating temperatures. PTFE packing is suitable for a maximum operating temperature of 450 deg F while Graphite packing is suitable for a maximum operating temperature of 650 deg F.
Stem: The valves use high strength, cold rolled screws which are secure, do not rotate and are isolated from the fluid and contamination through the use of a stainless steel stem bushing. Materials of Construction: The valves are manufactured in materials which meet and comply with the latest editions of NACE MR 0175 and ISO 15156 making them suitable for installations using acid and sour gas.